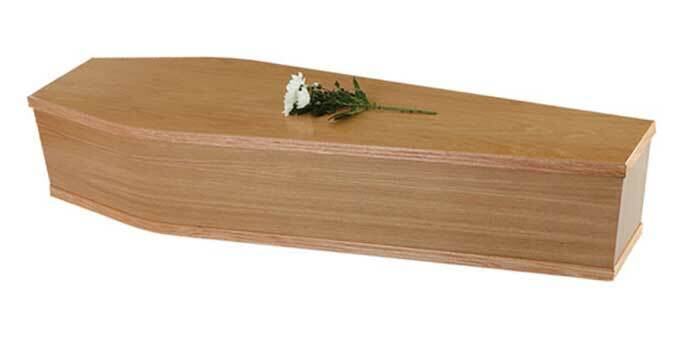 If you prefer to have a coffin other than the oak veneer, plain cardboard or shroud which are included in our fee, then this is no problem. 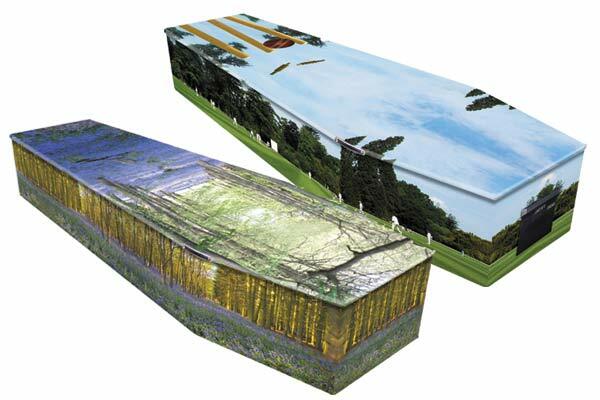 Below is a selection of some of the coffins that we can provide. Of course you’re perfectly free to provide your own but do ask us if there are other coffins you have seen that you would like to use. Some outsize coffins may cost a little more. The prices below are where coffins are provided as part of a funeral; please call if you would like a coffin-only price. For a simple and eco funeral. 100% natural and biodegradable, the perfect canvas for artwork, photos or just flowers. Available in white or extra long with a £40 supplement. Suitable for cremation or burial. 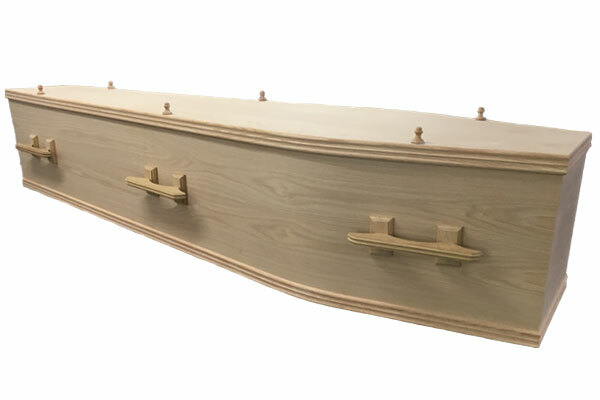 Traditional shape light oak veneer coffin. Choose from either wooden, silver or gold effect handles. Suitable for cremation or burial. For a truly personal and environmental funeral. The shroud is not for everyone but we notice a real connection between people who come to the funeral and the person who has died. Cremation or burial. For a personal and colourful funeral. Made in the UK from 100% recycled paper, using eco-inks, these come in a huge range of designs, or you can supply your own pictures or designs. Suitable for cremation or burial. 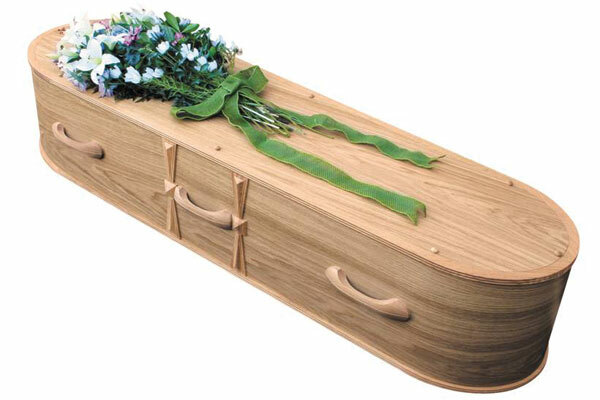 We love the soft shape of this oak veneer coffin with wooden handles. 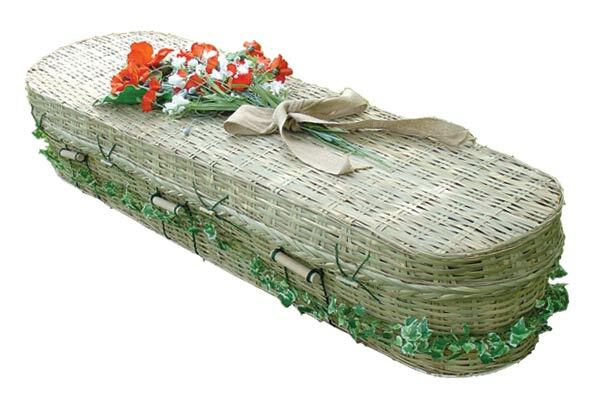 Constructed from FSC certified material, suitable for burial or cremation. Made by skilled craftsmen in nearby Worcestershire. A contemporary take on the old tradition of burial in wool. 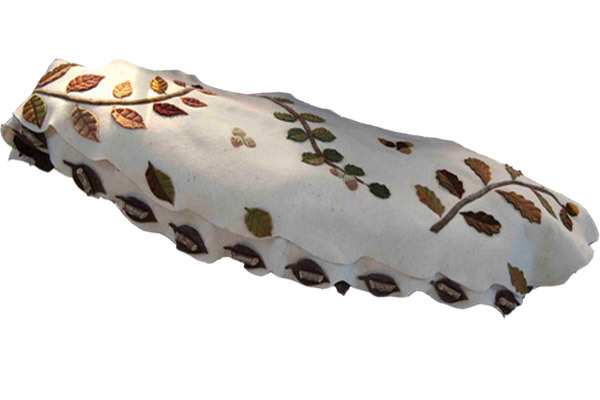 The award winning leafcocoon is a unique and well accepted alternative to conventional coffins. Handmade in Dartmoor using 100% natural materials and natural dyes. 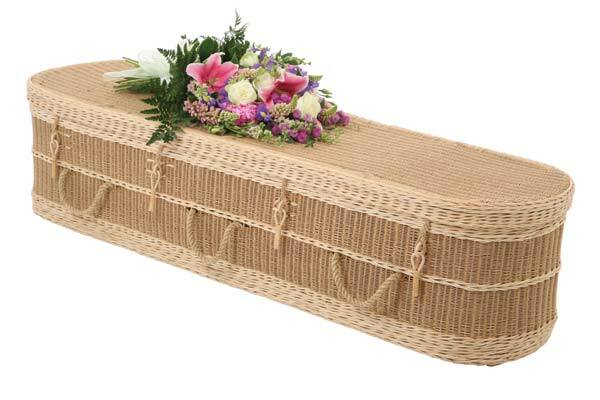 Made from sustainable European willow, this simple wicker coffin is available with a slightly wider weave allowing for a more competitive price. 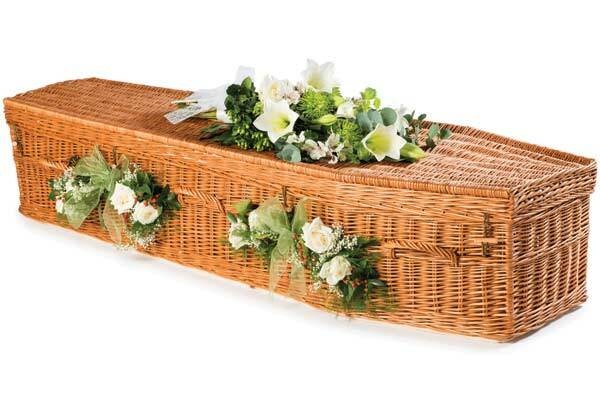 Fully lined, it is suitable for burial or cremation. 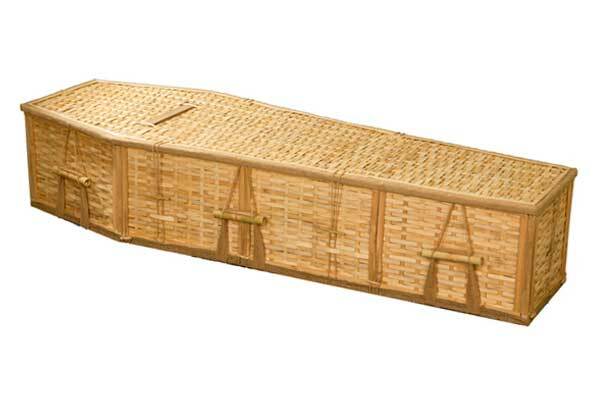 This bamboo coffin is woven with unstripped bamboo, from China creating a natural unbleached appearance and an unsophisticated charm. 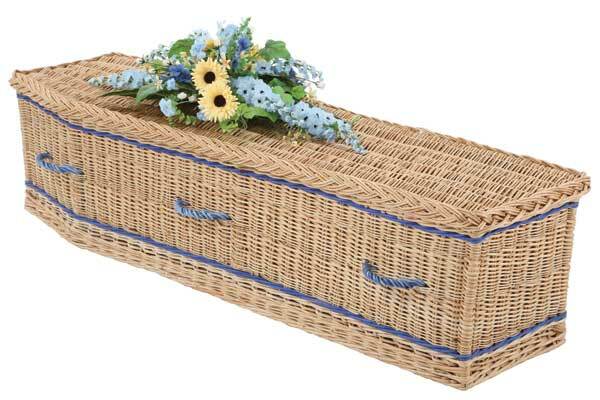 Lovely with flowers woven around either the lid or main part of the coffin. 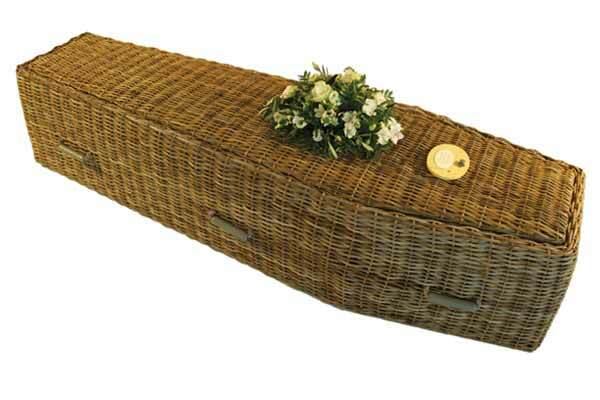 Choose from either a traditional (Highsted) or round ended (Cromer)coffin in willow for a lovely natural look. 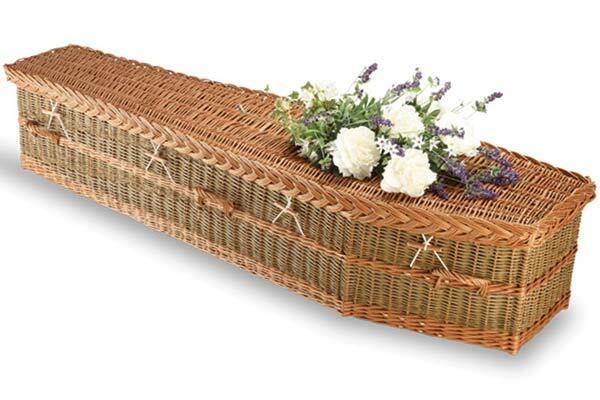 Suitable for cremation or burial, these coffins are are 100% natural and biodegradable. The leaves of the banana plant are woven around a natural Rattan frame. These are substantial, lightweight and golden coloured with strong rope handles. Traditional or Oval shaped. 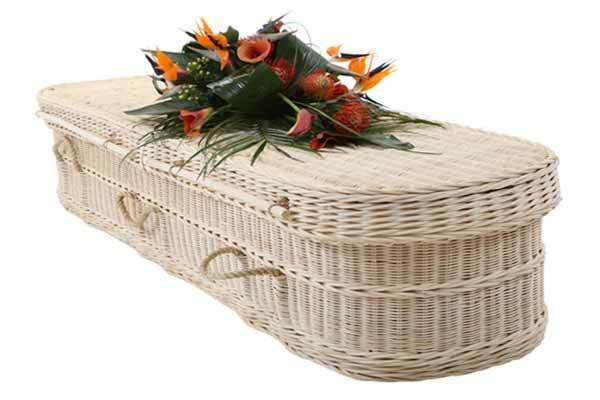 This oval loom coffin is made from natural paper which has been spun into long yarns. It is light brown with a cream cane trim and curved end shape. Suitable for burial or cremation. 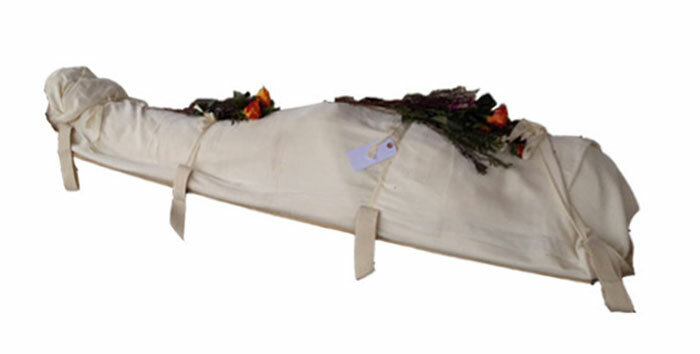 100% natural and biodegradable this coffin also comes in brown and cream: traditional shape or with round ends. Grown on the Somerset levels the colours are achieved by boiling and stripping the bark. Using willow grown in Somerset and handwoven by skilled basket makers. 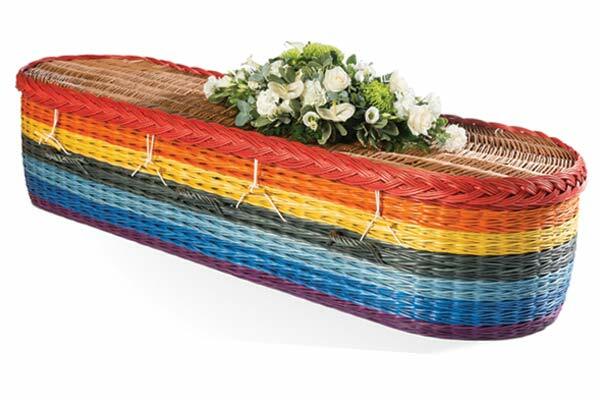 Willow coffins can be personalised with a beautiful selection of coloured banding and handles upon the family’s request. Gold, Buff or White. Traditional or oval. Using willow grown in Somerset these coffins can be coloured to your requirements with water based paints, and are suitable for burial, cremation and natural burial. Simply tell us what colours you would like. 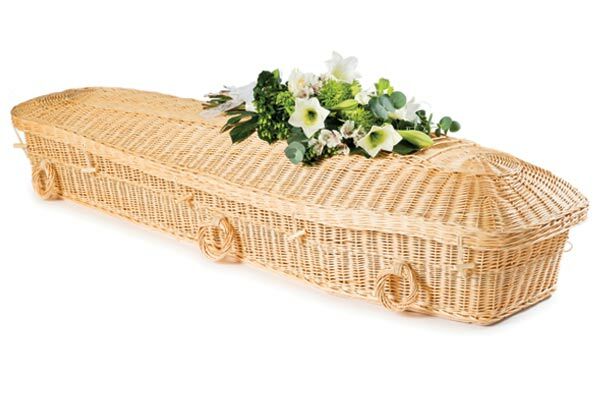 This coco stick coffin is made from the stem of the coconut palm leaf. The leaves are dried out and the stems are removed leaving tiny sticks which are strung together to create the coffin. 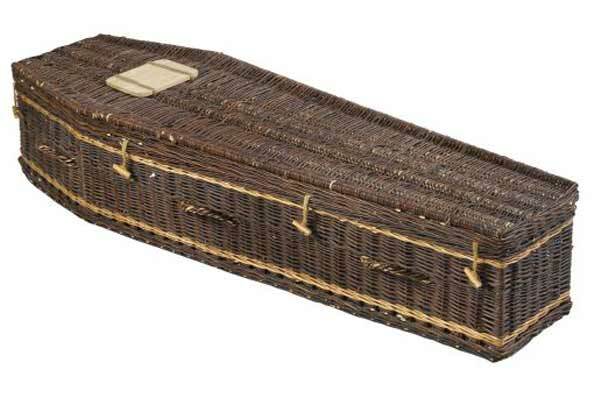 Suitable for burial or cremation. Matching ashes casket is available. A beautifully simple, hand crafted solid pine coffin with matching pine handles. 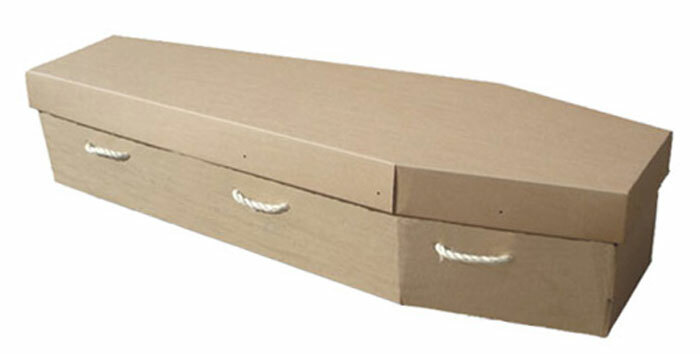 Quality, environmentally friendly coffins, manufactured from FSC certified wood. Rope handles available if required. 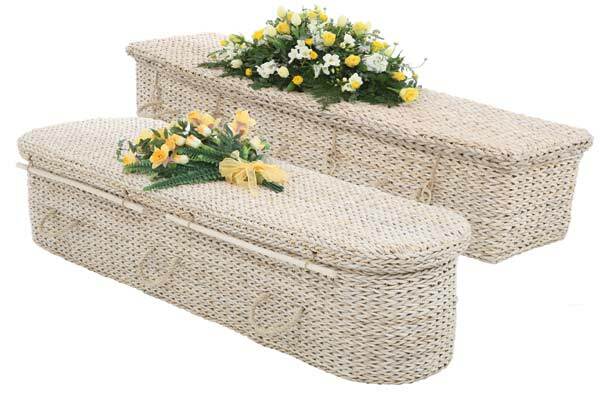 Sometimes referred to as wicker or rattan, these cane coffins are of an off-white appearance. Harvested from forests in South East Asia and rowing as much as six meters per year it makes a great renewable material. Available round or traditional shape. 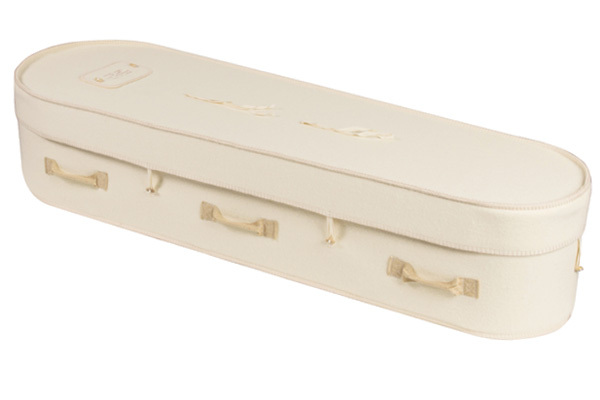 This oasis bamboo coffin is made from sustainably managed and harvested bamboo in Bangladesh and is certified Fair Trade. 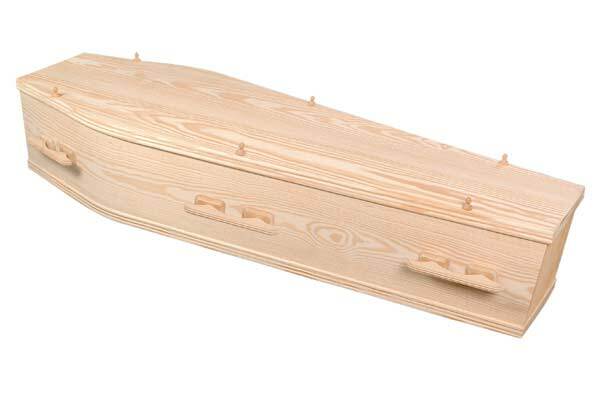 Suitable for burial or cremation. Matching ashes casket is available.Traditional shape with matching ashes casket if required. 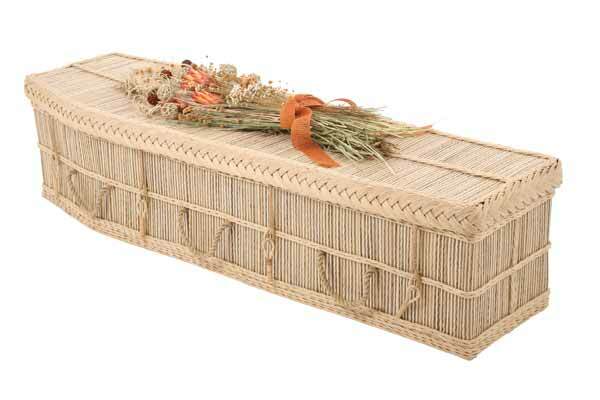 Woven onto a strong wooden Albasia frame this coffin comes in grey as pictured or golden wicker. Finished with bespoke wooden handles and hand carved wooden peg screws. 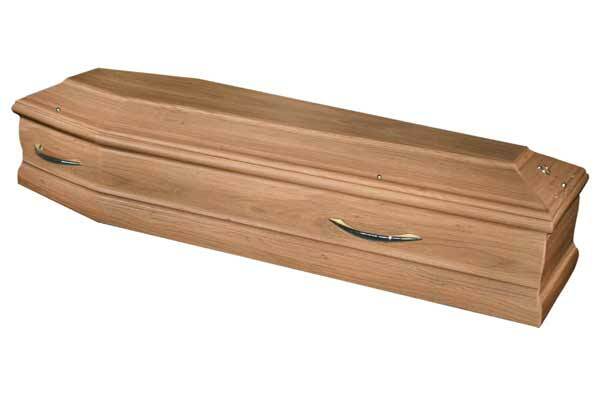 A solid hardwood coffin with laminate Walnut veneer, profiled sides and raised lid, polished in a satin finish. Solid brass handles available for additional fee for burial. Available also in Oak or mahogany veneer. 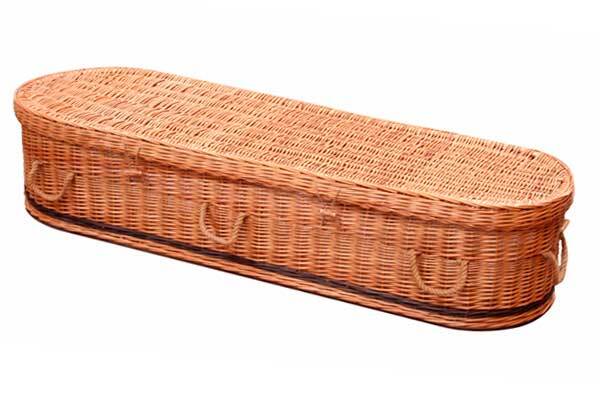 Made from sustainable European willow, we love this rustic chocolate coloured wicker coffin. Handmade without using glue or metal fixings, and suitable for burial or cremation.